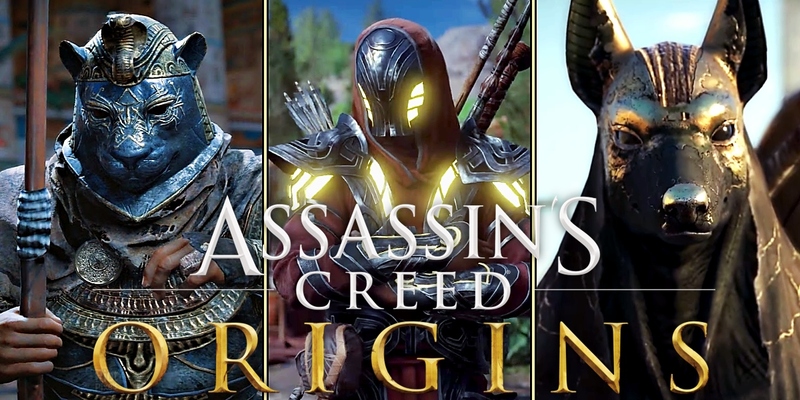 Now that Assassin's Creed: Origins has arrived, it's time for players to hunt down the best costumes, armors, and outfits locked away in secret. It's all part of the fun when it comes to a new AC release, and according to the early reviews, Origins is the best Assassin's Creed game in years. Does the armor and outfit choices rise to the occasion as well? That's up for the players to decide, but we're here to help guide them through the steps needed to equip Bayek in the finest threads Ubisoft has made available. Make no mistake, fans: to get the best outfits in the game, you're going to have to earn them. We'll begin with the outfit that every player will want to know about, since it's sure to be the most coveted. Not for its defensive abilities, since Origins, doesn't allow for an elite suit of armor to allow players to overpower enemies or the game's systems. It's all in the name of looking the most impressive, and nothing beats the Isu Armor. Named for the First Civilization that spawned the entire human race - and the larger mysteries and conflicts of the AC franchise - the outfit grants the wearer metal flourishes and style suited to Jupiter himself, complete with glowing yellow lights marking Bayek as truly blessed by "those who came before." And best of all, players won't need to defeat a series of impossible bosses to claim it for themselves. That's the good news. The bad news is that while the Isu Armor is technically available almost from the beginning of the game, players may soon realize that certain milestones will need to be met along the way. Still, for those players who don't want to miss a single second in which they could be playing through the game in these Isu threads, we're happy to lay out the mission, the mechanics, and the locations players need to know. The first step in the path to the Isu Armor comes when players first stumble upon the pyramids at Giza, accompanied closely by the Great Sphinx. It's the Sphinx you'll want to investigate, for a small hole in the stone granting access to a secret passage. If you look just East of the point at which the staggered angles of the pyramids would intersect, you can't miss it. Head inside, but be warned: you won't be able to unlock the Isu Armor just yet. But this is the location where you will ultimately unlock the outfit. The full complex hidden within will be exposed in due time, but for now, it's the sandy miniature model of the game's map that should hold your attention. Bayek may not hear the words, but the players can: THIS is the challenge issued by the First Civilization, with the Isu Armor the prize awaiting the one to complete it. To do it, players will need to solve each of the twelve Stone Circle puzzles scattered across the world, marked on this scale model by the pointed black rocks. Find and solve a single one of these starry puzzles, and Bayek will receive a Quest to solve the remaining eleven, in order to receive a treasure concealed in the heart of Egypt. That treasure is the Isu Armor, and fortunately for players, the Stone Circle puzzles fall closer to the rotating stone symbols of post-Black Flag adventures, as opposed to the complicated and challenging Tombs of previous ones. The Tombs of Origins are still important (for a reason we'll get to in a moment), but the actual Star Circles are built to be beaten. The hurdle to players is the areas where some of these puzzles are located. If players desired, they could abandon all story quests upon solving their first Stone Circle and devote all time to unlocking the Isu Armor, and can still try their luck at doing just that. But when the areas in which these puzzles are found is populated by enemies far more powerful than Bayek, it can become an exercise in grief and frustration quite quickly. Players are free to try for themselves, but past Level 25, it should be achievable. Completing the twelve Stone Circles and returning to the Sphinx scale model will grant players 3000 XP, but enough Silica will have to be gathered along the way - 50 to be exact. It's an annoying detail that demands players devote their time to the Tombs anyway. The only saving grace is that each Tomb contains an average of 5 Silica. Once the required Silica is gained, and the Stone Circles completed, return to the scale model room, and prepare to have your mind blown in typical Assassin's Creed fashion. Entering the model now triggers the reveal of a staircase into the true heart of the complex, where players can submit the required Silica and unlock the Isu Armor for themselves. It's just another piece of the puzzle, as is typical for games in this series, but at least Bayek will look like he knows the First Civilization's secrets. If the Isu Armor is too complicated to acquire, or players demand a more impressive look along the way, then we have fantastic news. The Isu isn't the only must-have outfit in the game's early chapters... but it's also not the most difficult to acquire. Read on for the details on the Sekhmet Costume and Anubis Outfit reserved only for Egypt's greatest warriors.